2. Your contract with us – When you sign the form on page 1 of this rental agreement you accept the conditions set out in this rental agreement. Please read this agreement carefully. If there is anything you do not understand, ask a member of staff to explain it. 3. Rental period – You will have the vehicle for the period shown in the agreement. We may agree to extend this rental period, but the total rental will not be for more than 90 days. If you break our agreement, we can ask you to bring back the vehicle before the date and time we have agreed with you. To do this we will give you written notice in person or send it to the address you have given on page 1. Once we have given you the notice in person, you will no longer have our permission to have the vehicle. If we send you a notice in the post, one day after we have posted it you will no longer have our permission to have the vehicle. We may then take back our vehicle. If we believe you have given us false information, we may take back the vehicle without giving you any notice. 4. Your responsibilities – You must inspect the vehicle and any accessories we provide before you take the vehicle. If you are not satisfied with the vehicle or you do not think the condition of the vehicle meets our pre-rental inspection report, you should let us know. You must look after the vehicle, any accessories and the keys or other locking device for the vehicle. You must always lock the vehicle when you are not using it, and use any security device which is fitted or which we supply. You must always protect the vehicle against weather conditions which could cause damage. You must make sure that you use the correct type of fuel and fluids in the vehicle. Depending on section 9 of this agreement (‘Our motor insurance and damage protection programme’), you are responsible for any damage to the vehicle, including damage under carriage damage, and overhead damage (above 6ft in height) caused by but not limited to hitting low level objects such as bridges, low hanging tree branches or barriers. You will have to pay our reasonable costs for bringing the vehicle back to the condition stated in the pre-rental inspection report. This could include but is not limited to any damage inside and outside the vehicle, cleaning costs if the vehicle is very dirty, and replacing any items or accessories. You must not sell, rent or get rid of the vehicle or any of its parts. You must not give or try to give anyone the legal rights to the vehicle or transfer legal ownership. You must not let anyone work on the vehicle without our permission. If we do give you permission, we will only give you a refund if you have a receipt for the work we have given you permission for. You must let us know as soon as you become aware of a fault with the vehicle, or if the vehicle is stolen or involved in an accident. If we have agreed to drop off the vehicle at an address you give us, you will be responsible for the vehicle from the time we drop it off. Unless we have agreed to collect the vehicle from you, you must return the vehicle to the location or rental branch we agreed. You must return it during the opening hours or at a time we will you. When you return the vehicle, our staff must check its condition. If a member of staff is not available to check in the vehicle during office hours you will be requested to sign a waiver form. If we have agreed to allow you to return the vehicle outside of our opening hours, you will stay responsible for the vehicle and its condition until our staff have checked it. We may need to clean the vehicle before our staff can check its conditions. You must not carry any object or substance which, because of its condition or smell, may harm the vehicle or delay us renting or selling it. You are responsible for all damage whatsoever caused by misuse or negligence and for all tyre repairs or replacement, wing mirrors, and for any broken windows and lights and for any damage to the interior of the vehicle along with any overhead damage (above 6ft height) and undercarriage damage. 5. Our responsibilities – We will identify and tell you about any existing damage to the vehicle before you sign your acceptance.The vehicle is roadworthy and suitable for you to use at the start of the rental period. We accept no responsibility for delays and/or consequential losses from breakdown or from any other circumstances. If for any reason the vehicle rented shall become un-roadworthy for whatsoever reason we may at our discretion replace the vehicle. 6. Property – We are only responsible for loss or damage to property in the vehicle if the loss or damage is a result of our neglect or if we have broken the conditions of our agreement. You are responsible for removing your personal belongings from the vehicle at the end of the rental period, as we are not responsible for any items you leave in the vehicle. If you do leave items in the vehicle, we may agree to keep them for you to collect within a reasonable time. We may charge you reasonable costs for storing items. A refuelling service charge if you did not return the vehicle to us with the agreed amount of fuel. The charge will be £10 per ¼ tank for small cars, or £20 per ¼ for medium to large cars and all vans. All charges and costs relating to damage to the windscreen, wing mirrors, tyres (including punctures or replacement), overhead damage (above 6ft in height) and the undercarriage of the vehicle as set out in section 9. 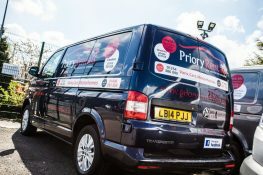 All charges and legal costs for any congestion charge, road traffic offence or parking offence, parking charges or any other offence involving the rental vehicle, including costs from the vehicle being clamped, seized or towed away. You are responsible for paying the appropriate authority or company for any charges and costs if and when they ask for these payments. You will also be responsible for paying our administration charges of £25 (inc VAT) for each time we deal with these matters. The reasonable cost of repairing any damage to the vehicle which was not noted at the start of the agreement, whether you were at fault or not (depending on section 5). You will also be responsible for paying the reasonable cost of replacing the vehicle if it is stolen or written off, depending on any insurance you have (as set out in section 9), if and when we demand this payment. We will only charge you for loss of income if we cannot get back out losses under the damage protection programme, as explained in section 9. We will charge you at the published daily or hourly rate, and we will never charge you for more than 30 days. We will always do everything we can to make sure we repair the vehicle or get back our costs as soon as possible. In the event of cancellation of your rental vehicle before hire your booking deposit is none refundable. 9. Our motor insurance and collision damage waiver – You can get full details of the collision damage waiver from the office at which you have rented the vehicle. If we arrange separate motorhome insurance, we will give you information on the motor insurance cover and any restrictions which may apply. Otherwise, the conditions of our motor insurance and collision damage waiver will apply. By signing in the appropriate box on page 1 [of the rental agreement], you are accepting the conditions of our motor insurance. We have a legal responsibility to have third-party motor insurance. This provides cover for claims if you injure or kill anybody, or damage their property. We will provide cover of 50% of the loss or damage to the vehicle if you have purchased ‘collision damage waiver’. Even if you accept this, you still have to pay an amount up to the ‘responsibility amount’ every time you damage the vehicle. The responsibility amount you have to pay in each case is shown on page 1 [of the rental agreement]. Even if the ‘collision damage waiver’ is purchased you are responsible for payment in full for damage to windscreens, wing mirrors, tyres (including punctures or replacement), overhead damage (over 6ft height) or the undercarriage of the vehicle. Give us back all keys and report the theft or loss to the police as soon as reasonably possible. 12. Data protection – By entering into this rental agreement you agree that we can process and store your personal information in connection with this agreement. We will use your information to analyse statistics, for market research, credit control and to protect our assets. You agree that if you break the terms of this agreement we can pass your personal information to credit reference agencies, debt collectors, the police or any other relevant organisation. We can also give this information to the British Vehicle Rentals and Leasing Association (BVRLA), which can share your personal information with its members to prevent crime and protect its assets, as allowed under the Data Protection Act 1998. 14. The law – We aim to deal with all disagreements fairly and calmly. If we cannot deal with a disagreement, we may take the matter to the BVRLA’s conciliation service. This agreement is governed by the laws of the country in which you signed it. Any disagreement may be settled in the courts of that country. This agreement contains all the conditions which we have agreed and replaces any written or verbal agreements we have with you.